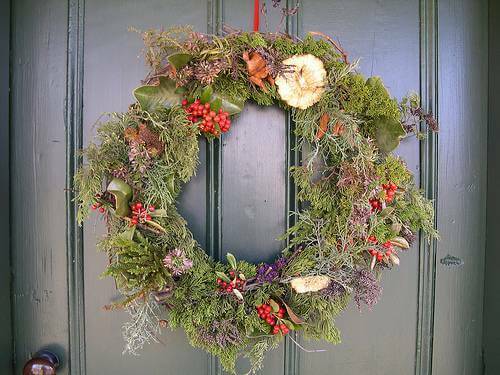 With the holidays fast approaching, now is the time to learn how to make a wreath! If you like making crafts and decorating for the holidays, you should try your hand at wreath making. Personally, I feel that making my own holiday decorations is one of the most enjoyable activities of the season. Learning how to make a Christmas wreath is easy; the hard part is deciding which one you want to make out of all the beautiful choices. Don’t worry if you are new to wreath making– wreaths can be as easy or as elaborate as you like. There is a wreath for every talent level. For those of you wondering how to make holiday wreaths, here are a few samples of wreaths along with instructions. It probably comes as no surprise that I love wreaths that use fresh greenery and floral elements. There is nothing like the smell of live Christmas greenery. If you have fir, pine, holly, boxwood, or other evergreens, you may want to learn how to make a Christmas wreath yourself from scratch. You will need a wire wreath frame; an average sized wreath requires a 10-15 inch diameter round wreath frame. These can be purchased at craft stores, or you can make your own. You will also need strong twine or wire for binding the sprigs to the frame. Once you have your supplies, cut sprigs from your tree or shrub that are 4-6 inches long for an average sized 15 inch wreath. Attach the twine or wire to the frame and then start tying the sprigs onto the frame securely, overlapping sprigs until the wreath frame is completely covered. If you don’t have any suitable evergreens of your own, don’t worry! Most places that sell Christmas trees sell greens as well, or you can find them at garden centers. If you don’t like the idea of making your own wreath from fresh greenery, you can always purchase fake or real evergreen wreaths at most stores and still decorate them yourself. 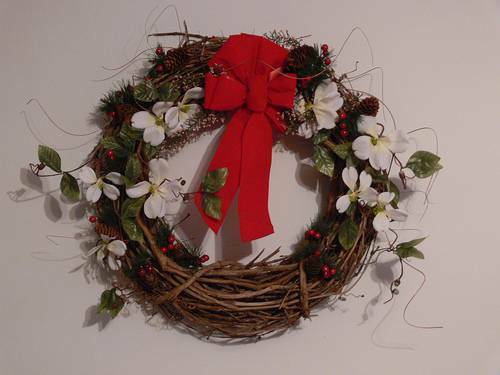 Grapevine wreaths and straw wreaths are also sold in most stores and can be quickly and easily decorated. When decorating an evergreen wreath or grapevine wreath, I personally like to let the natural beauty of the plants shine through by using adornments sparingly. To give a natural look to the wreath, I use berries, mosses, dried rose hips, seed pods, dried flowers, pine cones, acorns, nuts, and dried fruits. These can be attached with wire or twine or by hot gluing. Arrange them in a way that is pleasing to the eye; there are many pictures online to inspire you. Instead of an all-natural look, you may choose to spray your wreath with glitter or fake snow and embellish it lavishly. Wind colorful craft ribbon around the wreath, and add ornaments, silk flowers such as poinsettias, or whatever strikes your fancy. Craft stores have a wide variety of craft ribbons to choose from as well as floral picks with snowmen, berries, flowers, presents, and other holiday themed items that are easily tucked in to wreaths. Candy wreaths are always sure to be attention grabbers! There are several variations of the candy wreath. You will need a foam wreath frame, or a metal wreath frame depending on the type of candy wreath you choose to make, and a hot glue gun or tape. If using a foam wreath, wrap it in ribbon or foil that coordinates with the type of candy you are using. 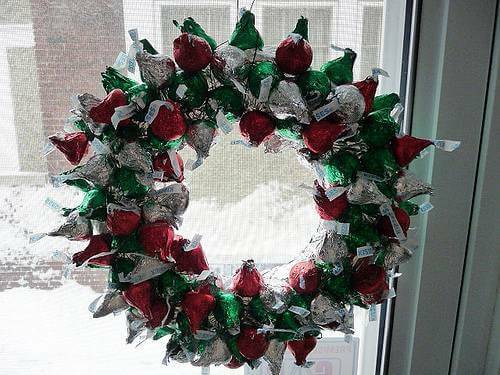 Hershey kisses, peppermints, and gumdrops are popular for making wreaths out of a single type of candy. After wrapping the foam wreath, start hot gluing the pieces of candy onto the wreath. An average sized wreath requires approximately 3 bags of candy. You can also make a candy wreath by attaching candy that comes in wrappers with tails to a wire wreath frame. Just wrap tape around one tail and the wreath frame. Make sure to overlap the pieces to give it a full look. Or, just add some candy as a decoration to any holiday wreath. While I can tell you that candy wreaths are well loved, I can’t guarantee that these wreaths will last long! Learning how to make a wreath has never tasted so good. Rag wreaths are a favorite of quilters and crafters who often have fabric scraps lying around, but they are also a favorite of people that can’t sew but admire holiday fabrics. 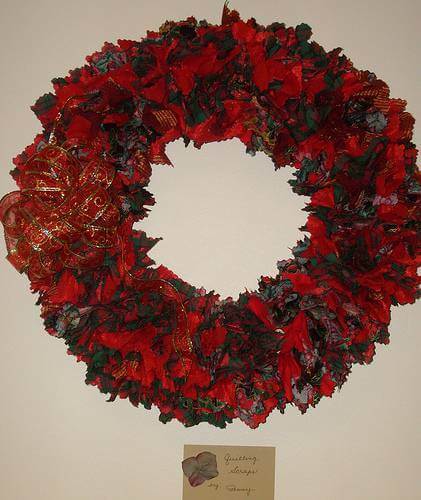 To make a rag wreath you will need a straw wreath and about a yard total of fabric, depending on the wreath size. Choosing two or three mostly solid fabrics that contrast works best. Cut the fabric into 2 or 3 inch squares using pinking shears to keep the fabric from unraveling. Then, place one square on the front of the wreath and take a chopstick, pen, or pencil and push the center of the square into the straw wreath. The result will be a ruffled almost flower like piece of fabric. Continue sticking the fabric squares into the straw wreath, sticking them close together for a full appearance. Cover the entire wreath except for the back. When finished, you may choose to add some embellishments like bells, snowmen, or bows. 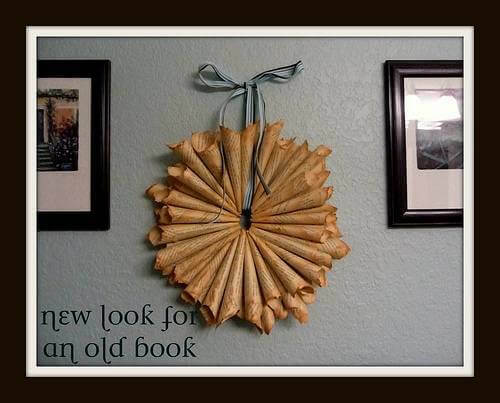 I have seen several interesting and pretty wreaths made out of book pages, old magazines, paper, plastic bottle caps, and even disposable Starbucks coffee cups! Once you discover how to make holiday wreaths like these, the trash around your house will suddenly become treasure. One easy and cheap eco-friendly wreath requires nothing more than paper, tape, cardboard, and a hot glue gun. Cut a wreath frame out of cardboard by cutting out a 12 inch circle. Inside of this circle, draw a 6 inch circle. An average wreath size is 12 inches, but you can do whatever size you like. Make cones out of paper from wrapping paper, magazines, brochures, fliers, book pages, scrapbook paper or whatever you want. Tape them to hold the cone shape then hot glue to the cardboard frame with the narrow pointed ends touching the outside of the inner circle. Continue until the entire wreath is filled in. In the middle circle, you could hot glue Christmas ornaments, a Christmas sign, bows, or whatever appeals to you. The possibilities are endless for wreaths!